Skishoeing’s roots run in two tracks (like skis!). Francois and I worked at Karhu together and in the late 1990’s Karhu started developing the concept of a sliding snowshoe. We both worked on this and through the years Karhu produced and sold a number of variations. The category was called Sweepers, an unfortunate name that conjours up cleaning utensils rather then the possibly of outdoor exploration. 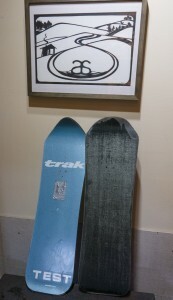 Ski models were called Meta, Morph, and Karver. I had mixed feelings about the design (as well as the names) and the utility of the Sweepers. The idea seemed great, but our application did not live up to my expectations in actual performance. I was (still am) a avid backcountry skier and considered the Sweepers to be too much of a compromise for someone like me to really use them much. Karhu sold quite a few pairs over the years, but the vision and execution was not well defined and suffered from too many opinions on what the Sweepers were, how they should be used, and who should use them. K2 bought Karhu in 2007 and was not interested in pursuing the category. When Karhu was eliminated by K2, Francois and I started discussing the possibility of our own company, dedicated to backcountry skiing with a more refined version of the sliding snowshoe (skishoe) being our first and most central product. We worked on a business model, ideas, and designs for a few years and officially started our company in 2011. 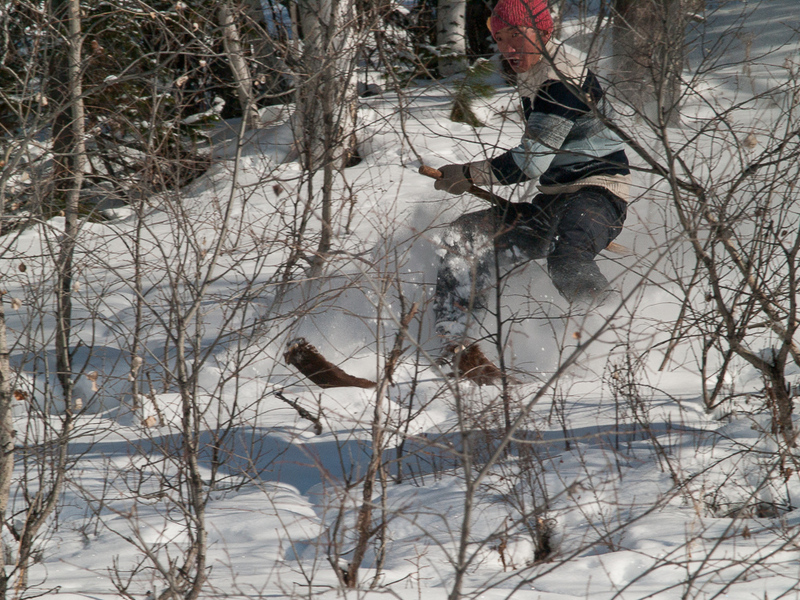 The roots of skishoeing are the roots of skiing. 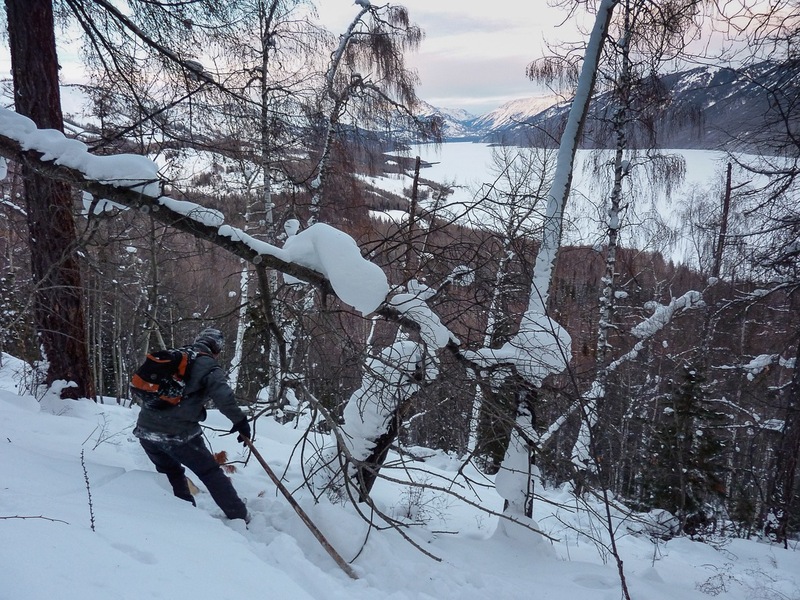 Skishoeing – combining skis with a permanent skin for uninterrupted travel through a snowy landscape goes back at least 10,000 years, and in it’s traditional form continues in remote pockets to this day. Skishoes are a utilitarian concept of skis, something used for access , travel, and subsistence in the winter world. 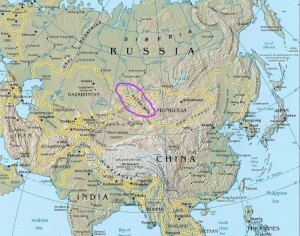 In 2005 I started a documentary project on traditional skiers in the Chinese Altai Mountains, pretty much in the center of Eurasia. 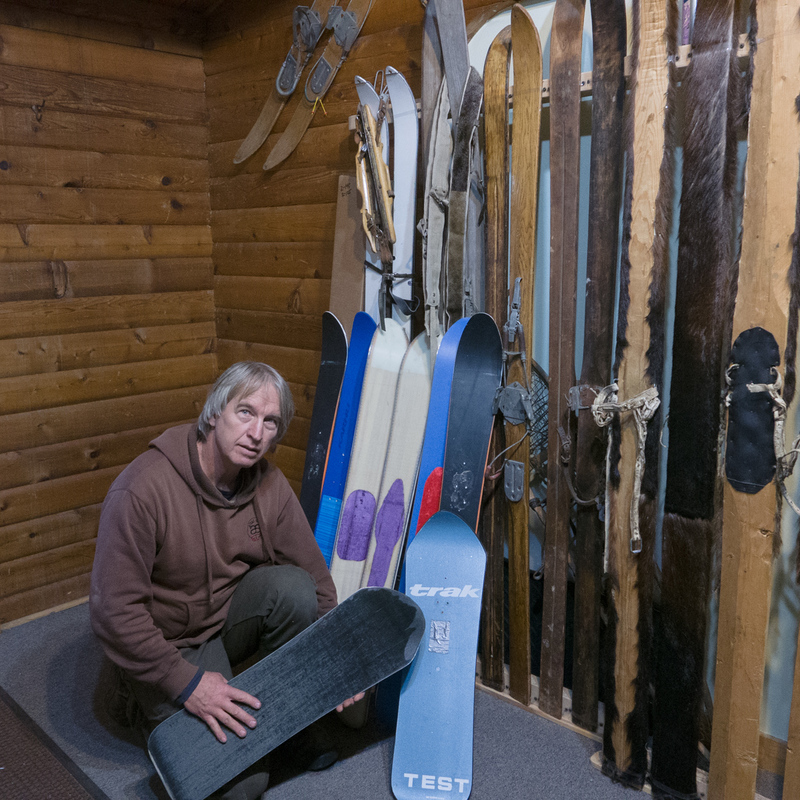 There are still a few pockets of skiers in this area that use traditional skis: for travel, caring for their domestic animals, and hunting and trapping. 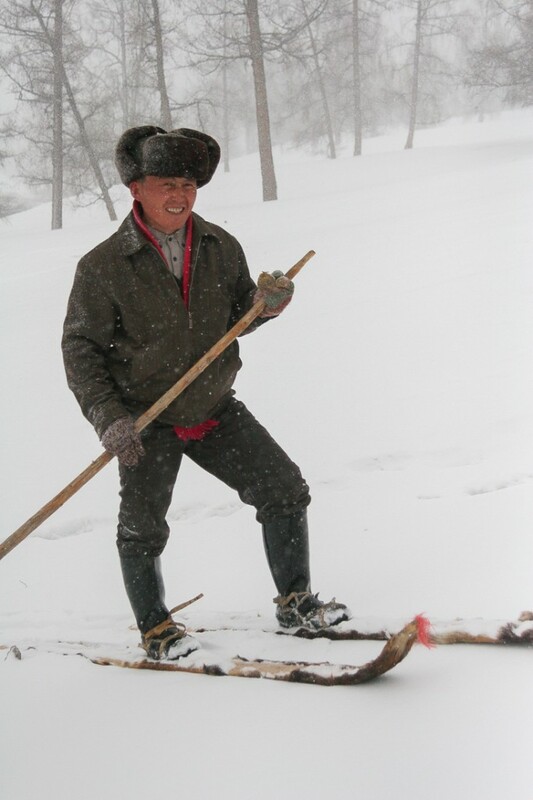 Ten years and nine trips later I am still actively documenting these skiers in the Altai Mountains. As a western skier with a fair amount of backcountry experience, I had a lot of preconceptions going into the Altai in 2005. On the one hand I was genuinely captivated by this really ancient form of skiing, still practiced. But as a western skier I was quite sure the skiing would be rudimentary, closer to slogging around on snowshoes then gliding on skis. I was confident that we would have a big advantage over the local skiers in speed, performance, and versatility, in both the uphill and downhill skiing. After all we had the latest in backcountry gear and between the 3 of us, a lot of experience touring in various places around the world. Like most of us in the west, I was also quite stuck in the western linear view of progress, neatly running in a straight line from ancient to modern. Led by competition and racing since the the early 1900s, both Nordic and Alpine skiing are really focused on glide. Modern skiing is about recreation, and glide is what captivates (and often terrifies) skiers. 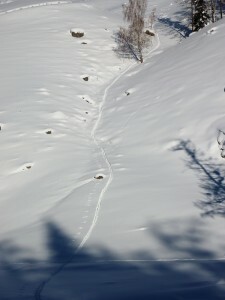 Utilitarian skiing was more rooted in practicality – skis were used only where necessary for getting around in deep snow. Hunting, transportation, reindeer herding and often the most basic chores of subsistence in the northern winters were assisted by or even depended on skis. 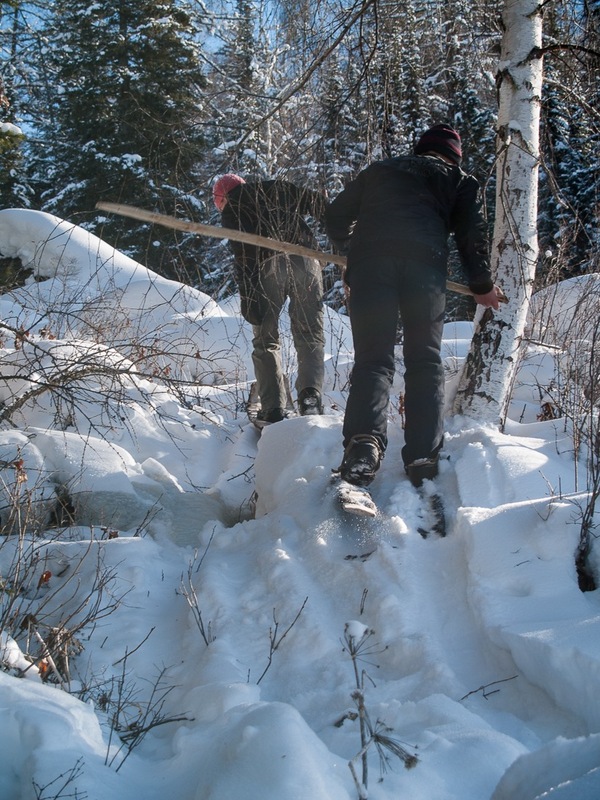 In marginal snow areas, skis often gave way to snowshoes; less efficient, but they were much easier to make and use when only needed on occasion(North America was the exception, as skis were never used in the traditional cultures of North and South America). For skis to be worth the extra investment in time to learn and build, they needed to glide, but also to travel effectively in the terrain and conditions of the area. 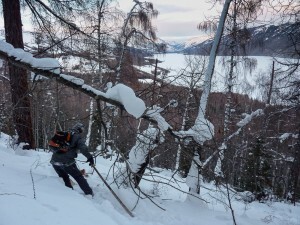 In places like the Altai, where there was a large amount of up and down, skis evolved to balanced gliding with climbing, often steeply, as well as breaking trail in what was generally deep unconsolidated snow. 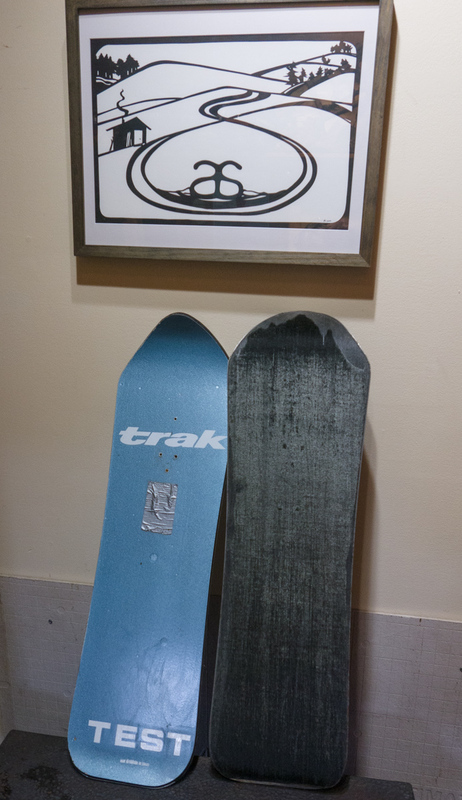 Skis with permanent skins were the perfect compromise for this. 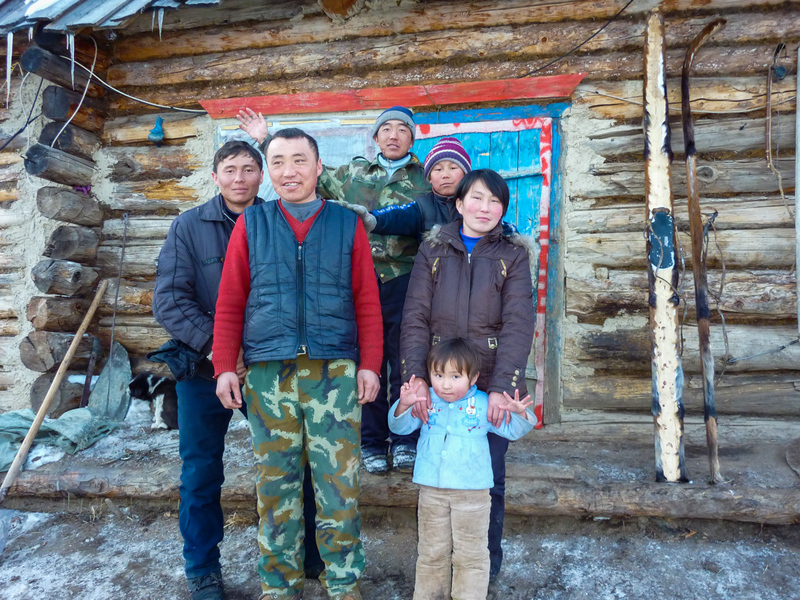 As I traveled to the Altai over the years, I found myself routinely humbled by the locals’ skiing, often struggling to keep up on even basic tours and when actually hunting or on multi day trips, often not able to keep up at all. 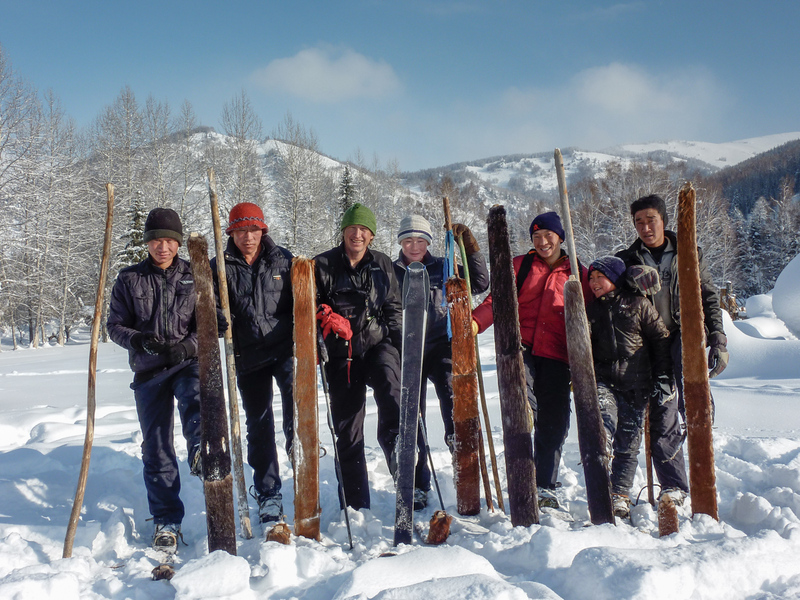 Local skiers in the Altai approached skiing much differently then we did. 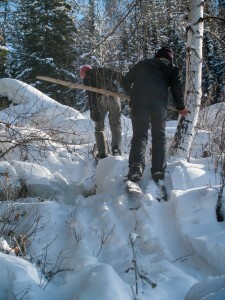 Turns were for avoidance of obstacles, tours were just that – up and down, through thick forests, across frozen lakes. We often climbed steeper then I had ever climbed, and regularly descended through thick conifer forests with no obvious openings or what we might call a “ski run”. These guys were traveling to hunt, trap, find lost domestic animals, or just to get around. They loved to ski and had lots of fun with it, but their skiing was not for the faint of heart. Looking for Elk – and a place to ski down. Their skis, unlike ours, were designed to go anywhere and everywhere without separation – no skins on or off or chronic gear adjustments, no worry about bases and rocks – just put them on and go. These skin clad skis, what I considered a liability in 2005, proved to be perfect for the kind of skiing they had to do in the Altai. I learned to love the freedom of movement and the ability to wander at will. thoroughly convinced of the utility of skis that had a permanent skin on them. The tradeoff of unrestricted glide for the ability to travel without restriction up and down and through deep snow was something I had experienced firsthand for the previous 4 years in the Altai Mountains. I was now a convert and could see that in many places in North America this would work, and work well. As skiers we can get trapped in a set of conditions or terrain by the gear we use without even knowing it. Nordic skis constantly nudge us into low angle terrain, modern skin based touring works for long climbs, but becomes fiddly and cumbersome for the variable ups and downs so common in the hilly and mountainous regions that surround much of where we live. For this new awareness of skiing in places often overlooked, I can thank my friends in the Altai Mountains, who gave me a new and much broader perspective on skiing and winter travel. Happily, my western views on on what skiing is and progress in general are buried somewhere in the deep cold snows of the Altai.